The shape of the back of a normal kneecap (patella) is a V-shape. The V-shaped patella sits in a groove at the front of the femur of the knee, called the trochlear groove. Some people are born with a shallow trochlear groove (= trochlear dysplasia). Some people have an L-shaped or completely flat back surface to their patella (= patellar dysplasia). An abnormally shaped patella + trochlear groove together, at the same time, is termed ‘patellofemoral dysplasia’. Patellofemoral dysplasia predisposes patients to anterior knee pain (pain at the front of the knee) and increased wear and tear to the articular cartilage in the patellofemoral joint, potentially leading to arthritis. Patellofemoral dysplasia can also be one of a number of various potential causes of patellar instability. Patellofemoral dysplasia can often be mistaken for lateral patellar maltracking, although the two conditions can co-exist together simultaneously. The only way to properly assess potential patellofemoral dysplasia is with special X-rays, specifically including a patellar skyline view (which is taken looking at the knee end on, with the joint bent to 20 or 30o). The best way to look for potential articular cartilage damage in the patellofemoral joint is to get an MRI scan. Unfortunately, there is no easy way to treat patellofemoral dysplasia. The only way to ‘cure’ it is to perform a patellofemoral resurfacing arthroplasty (a partial knee replacement), but this is a fairly major op that involves putting in an artificial joint, and this is normally reserved only for older patients and/or patients with severe symptoms and severe damage. Many patients respond well to physiotherapy treatments and avoidance of exercises that involved heavy loading of the patellofemoral joing (e.g. deep squats, lunges, heavy weights and impact). The patella sits at the front of the knee in between the quadriceps tendon and the patellar tendon, and acts like a pulley to increase the moment arm of the pull of the quads as the knee extends from a bent position. ‘The patellofemoral joint’ refers to the articulation between the back of the patella and the groove in the front of the femur, called the trochlea. The back of the patella (the articular surface) is V-shaped, and it sits in the reciprocal V of the trochlea. Normal patellar skyline X-ray view, showing V-shaped patella sitting nicely in the middle of the V-shaped trochlear groove. When the knee is fully extended (straight), the patella is actually sitting above the trochlear groove, resting on a pad of fat. As the knee bends to about 20 to 30 degrees or so, the patella enters the trochlear groove and slides down the middle of the groove. In deep flexion (like a deep squat) the patella actually exits the trochlear groove and sits below the trochlea, resting on the fat pad that sits at the front of the middle of the knee, in front of the ACL. Most people’s patellae and trochlear grooves are nice V-shapes. The sulcus angle is the angle that the deepest part of the trochlear groove makes, which is normally about 135 degrees. The shape and position of the patella in the trochlear groove cannot be measured from an MRI scan. MRI scans are taken with the patient lying down on a bed, in the tunnel of the scanner. In this position, the kneecap is sitting above the trochlear groove and the MRI pictures of the front of the femur do not show the groove at the correct angle (which should be perpendicular to the actual groove). The only way to properly and accurately measure the shape of the patellofemoral joint is with a Patellar Skyline X-ray. This is an X-ray taken looking upwards at the front of the knee from the foot up towards the head, with the knee bent to about 30 to 45 degrees. Wiberg Type II = an L-shaped patella, with a long flat lateral facet and a short vertical medial facet. Wiberg Type III = a completely flat patella, with no significant medial facet. Type II and Type III represent worsening grades of patellar dysplasia. When the trochlear groove is much more than about 135 degrees, i.e. shallow instead of deep, then this is referred to as trochlear dysplasia. If a patient has both patellar dysplasia and trochlear dysplasia, then this is called patellofemoral dysplasia. 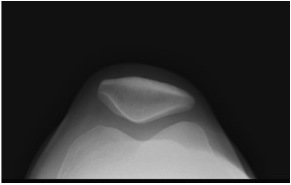 Patellofemoral dysplasia, as seen on a patellar skyline X-ray. Each patella is L-shaped instead of the normal V-shape. Each trochlear groove is shallow. When examining this patient’s knees from the front, the patellae will look as if they are laterally maltracking. However, the median ridge of each patella is sitting nicely over the middle of the trochlear groove of each knee, and hence this is pateillofemoral dysplasia and not lateral patellar maltracking. The importance of the shape of the patellofemoral joint lies in the distribution of pressures/forces on the back of the kneecap. With a normal V-shaped patella, the patellofemoral contact stresses are distributed and dissipated fairly evenly through the medial and lateral patellar facets to the base and each side of the trochlear groove. With patellar dysplasia, more force passes through the lateral facet. The joint forces on the outer (lateral) side of the patellofemoral joint are therefore increased. This can then lead to pressure overload on the articular cartilage that covers the surfaces of the bones, causing pain and eventually leading to increased wear and tear, and eventually arthritis.